I first became aware of the “Blessing of the River” ritual a couple years ago while we were visiting the Nubian House in Luxor. 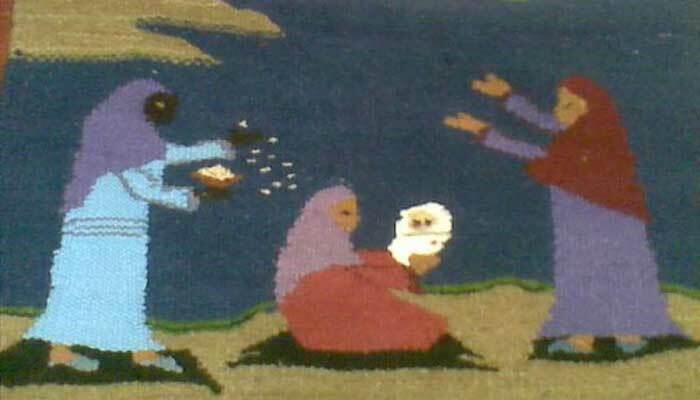 I always ask Mr. Gamal Latif to explain the stories in the rugs to us, and every year we would see this carpet and listen to this baby ritual. So far we do not know a traditional name for this ritual, whether in a Nubian language of Kenzi or Fadiki, or in Arabic; I am searching my reference books and we are still asking Nubians which I will continue in June. We are not referencing the sabou’a ritual that happens a week after the birth, this is something different. Gamal has suggested the name as the “Blessing of the River” – it describes this ritual beautifully and accurately. All up and down the Nile there is a ritual called the sabou’a. In Cairo it occurs on the seventh day after the birth of a baby, thus the name sabou’a, based on the word sabaa which is Arabic for the number 7, this is where we get the word sabath, the seventh day. In the sabou’a ritual the women of the family celebrate the week-old baby. Some Nubian groups do the sabou’a, other Nubian groups only do the “Blessing of the River” after their confinement, and some according to al-Guindi³ do both. During confinement there are a complex of mushahara beliefs and practices that ritually protect the mother and child during this vulnerable time.² At the end of the 40 day confinement al-Guindi³ observed that the mother and child, assisted by family women, the “old lady”, and village children go to the Nile river, bringing ritual foods and goods such as henna, perfume and kohl. They throw 7 lumps of sweetened bread or rice milk into the river, after which the women and children eat from this dish. The baby’s face is washed with water. Some groups fill jugs of water and bring them home for the mother’s “arba’in” (forty-day) ritual bath at home. Other groups with indoor plumbing have the ritual bath before the Blessing of the River. We must remember there are many groups of Nubians, from different cultural-linguistic groups, different lineages and villages before the relocation and different experiences since. My specific interviews quoted here are from the Nubian group living on the East Bank on the south edge of Luxor, Egypt. Previously from south of Aswan, the elders of this area moved north to this area of good farmland after the first dam was built. The Nile river was rising, but the second High Dam was not built yet and the Relocation had not occurred. After these Nubian families bought land and moved to Luxor, they found that they were not allowed irrigation water, so the young went elsewhere to work to send money home, some eventually returned and created a community. This community does not do the sabou’a, after the birth of her baby the mother does not leave the house for at least 15 days, longer if the moon has not reached the crescent yet. It is still viewed as the arba’in (forty-day) although the exact number of days varies. When the new moon is born, the new mother showers with 7 pieces of palm leaves in the water, the family ladies give her massage and bind her abdomen. Then the women and children go to the Nile. Post by ‎البيت بيتك بس بالنوبى‎. Next week we will continue the discussion of the “Blessing of the River” and discuss more traditions of the Nubian groups throughout Egypt. ¹ Thank you Mr. Gamal Latif for supporting our understanding of Nubian Culture through your stories, paintings, interviews and my never ending questions. ² Kennedy, John G.; Nubian Ceremonial Life, The American University in Cairo Press, Cairo 2005, pages 125-134 Kennedy; “Mushahara”. ³ Kennedy, 2005; pages 104-113 Fadwa al-Guindi; “The Angels in The Nile: A Theme in Nubian Ritual”. Interesting story! I am reminded here that the Ark of the Covenant, like Noah’s ark, is a boat or raft. Illustrations of the Ark of the Covenant, based on scriptural descriptions, portray it as looking more like a big treasure chest with long poles to carry it from place to place. In Greek mythology, as well as old Persian and Arabian stories, there are tales of women – some with infants – being thrown out to sea in big chests like this, which miraculously wash ashore with their contents alive and well.